The U.S. Air Force's secretive X-37B space plane is poised to launch on its second mission Friday (March 4), though what exactly it will be doing once it leaves the ground remains a mystery. The robotic X-37B mini-shuttle is slated to lift off from Cape Canaveral, Fla., on Friday atop an Atlas 5 rocket, weather permitting. Its launch window opens at 3:39 p.m. EST (2039 GMT), according to the launch provider United Launch Alliance, which is overseeing the flight. This will mark the second space mission for the Air Force's X-37B space plane program — but the first for this particular plane. It is the second X-37B spacecraft built for the Air Force by Boeing and carries the name Orbital Test Vehicle 2, or OTV-2. Current forecasts for Friday's X-37B launch try predict a 70 percent chance that bad weather may delay the flight, Air Force official have said. With its blunt nose and stubby wings, the unmanned X-37B spacecraft resembles a miniature version of NASA's space shuttles. The vehicle was originally developed as part of a NASA project that was shifted to the military when funding ran dry. The spacecraft is about 29 feet (almost 9 meters) long and 14 feet wide (nearly 4.5 meters), with a payload bay about the size of a pickup truck bed. It is designed to launch vertically inside the nose cone of a rocket, stay in orbit for months at a time, and then land horizontally on a runway like a space shuttle. "There is no one on the ground with a joystick flying it," Lt. Col. Troy Giese, X-37B program manager in the Air Force Rapid Capabilities Office, said before the first X-37B mission blasted off last year. The Air Force Rapid Capabilities Office oversees the X-37B space plane program for the U.S. military. Air Force officials have not said much about first X-37B mission, and they're been similarly tight-lipped about the upcoming second flight with the OTV-2 vehicle. 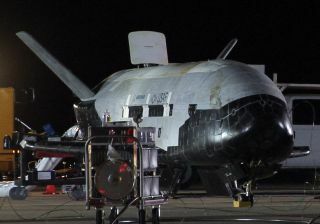 But the Air Force has said that the X-37B spacecraft should help the Air Force test and demonstrate new technologies — such as guidance, navigation and control systems — that could be used on future satellites. The secrecy surrounding the X-37B has led to some speculation that the plane could be a space weapon of some sort. But Air Force officials have repeatedly denied that charge, and some experts have postulated that it is a platform for space reconnaissance. The X-37B is built by Boeing's Space and Intelligence Systems division. It can fly long, extended missions because of its solar array power system, which allows it to stay in orbit for up to 270 days, Air Force officials have said. Originally, NASA used the space plane as an experimental test bed until funding for the project ran out in 2004.